I used to have a relatively long commute in to work, with a 30 minute drive and a 15 minute walk (I am cheap, and hate paying for parking). Because I have the attention span of a 6 year old meth addict, making this trip without something to listen to was unacceptable. So, I developed a insatiable addiction to podcasts. Here are the ones I listen to regularly. 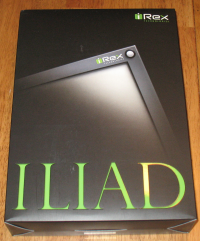 Last December, I was lucky enough to get my hands on an Irex Iliad. E-readers are an emerging technology which haven’t yet caught on with the general public. In fact, many people don’t realize such things even exist – I’ve encountered many of these while reading on the bus. I thought that now that I’ve used and owned one for 6 months it would be a good time to share my experiences. This won’t be a review per se but more an description of what it is like to use an Iliad.